The Second Sunday service is a series of special services led sometimes by the Chaplain or one of the Lay Readers or Readers in training. Details of future second Sunday services will appear here. The second sunday service in December is the service of 9 lessons and carols. As this is a very popular service you need to obtain entrance tickets to attend this service. Please follow this link for details. 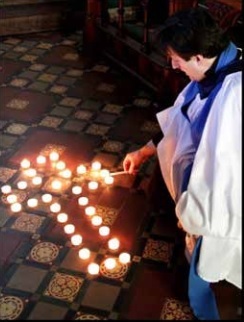 A Taize style service will be held led by Graeme Lloyd-Roberts, one of our Licensed Readers. 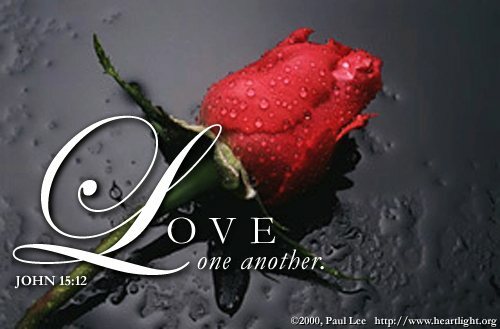 The service consists of simple songs, readings, silence and prayers. The service will give us a space and time in which to reflect on and thank God for His world, to pray for Peace and to be calm before the Church season of Advent and Christmas. 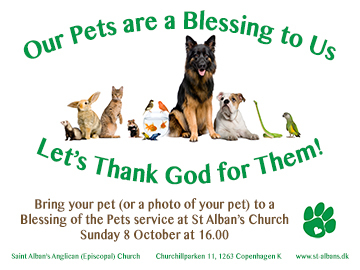 A Blessing of the Pets service will be held at St Alban’s at 16.00 on Sunday 8 October. Everyone is welcome to bring their dogs, cats, hamsters, goldfish, etc. to receive a special blessing at this service. You can also bring a picture of your pet if that's easiest for you. Mr. Julian Simpson, Reader in Training at Saint Alban's will lead a Service of Evening Prayer at 16.00 on Sunday 10 September. 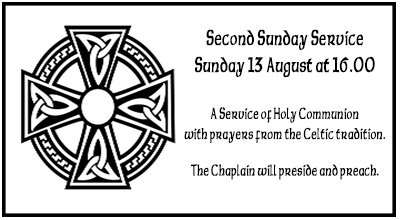 The next Second Sunday service will be held on Sunday 13 August at 16.00. It will be a Communion Service, with prayers from the Celtic tradition. The Chaplain will preside and preach. The next Second Sunday Service — to be held at 16.00 on Sunday 11 June — will be a service that celebrates God´s creation and increases awareness of our stewardship of the earth. It will be lead by Ursula Sonnewald (Licensed Reader) and the address will be by Anton Kongshøj-Munch (Environmental Officer at Saint Alban’s). All are welcome. New Jerusalem / Old Jerusalem lead by reader in training Jane Passant. Stations of the Cross service led by Ursula Sonnewald, one of our Licensed Readers. The Stations of the Cross have formed part of Christian devotion at Passiontide for many centuries because they enable us to engage actively with the path of suffering walked by Jesus.They originated when early Christians visited Jerusalem and wanted to follow literally in the footsteps of Jesus, tracing the path from Pilate’s house to Calvary.They would pause for prayer and devotion at various points. Eventually those pilgrims brought the practice back to their home countries and ever since then Christians of differing traditions have used this form of devotion.This quiet Stations of the Cross service, led by Licensed Lay Minister Ursula Sonnewald, will consist of sitting in a circle and taking turns in reading texts about the 14 stations of the cross separated by meditative music. The service will give us a space and time in which to reflect on and thank God for His world and to be calm during the Church season of Lent. Please join us for a special St Valentine’s service at St Alban’s Church on Sunday 12th February at 16:00, led by Reader-in-Training Julian Simpson, where we will give thanks for the love present in our lives and be reminded of other expressions of God´s love for us. This will be an opportunity to give thanks for the people in our lives who love us and for those whom we love in a service that blends the traditional and modern.